New Census Data ranks North Carolina as one of the fastest growing states in America. High Point is located in the state’s Piedmont Triad, which spans 12 counties serving 1.8 million residents. While High Point is primarily known as the “Furniture Capital of the World”, its economic drivers are diverse including sectors such as banking, manufacturing, and pharmaceuticals. Apartment vacancy rates amongst similar properties in the High Point submarket are below 5% due to limited existing supply as well as limited newly planned developments. 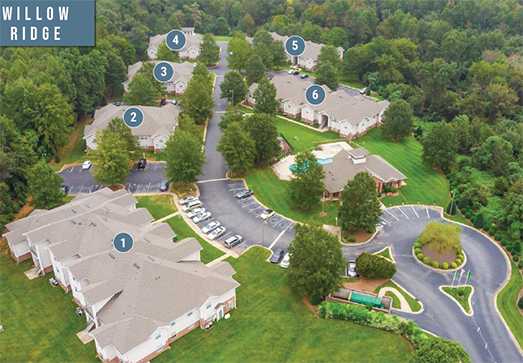 Creekside at Bellemeade is comprised of six, two-story multifamily apartment buildings. The community features a well balanced mix of two-bedroom, three-bedroom, and four-bedroom apartments totaling approximately 90,000 rentable square feet. Creekside at Bellemeade provides affordable housing to families earning no more than 50% and 60% of Guilford County’s AMI (area median income). Each set aside has a dedicated number of units ownership must lease to renters within the prescribed income caps. Creekside at Bellemeade will provide investors with the opportunity to acquire a stabilized asset, at well below replacement cost. Modest rent increases coupled with more efficient management practices will bolster investor returns going forward. We anticipate investor cash on cash returns in excess of 7% year one with subsequent increases as we benefit from fixed debt service payments for the term of the investment. New Census Data ranks North Carolina as one of the fastest growing states in America. Greensboro is located in the state’s Piedmont Triad, which spans 12 counties serving 1.8 million residents. The region’s economy has historically been tied to furniture and textiles, but new growth industries are emerging rapidly, including distribution, logistics, biotech, and aerospace. Apartment occupancy rates amongst similar properties in the Greensboro are strong. Willow Ridge has maintained physical occupancy in excess of 98% over the last three years. Willow Ridge is comprised of six, two-story multifamily apartment buildings. The community features a well balanced mix of two-bedroom, three-bedroom, and four-bedroom apartments totaling approximately 90,000 rentable square feet. Willow Ridge provides affordable housing to families earning no more than 50% and 60% of Guilford County’s AMI (area median income). Each set aside has a dedicated number of units ownership must lease to renters within the prescribed income caps. Willow Ridge will provide investors with the opportunity to acquire a stabilized asset, at well below replacement cost. Modest rent increases coupled with more efficient management practices will bolster investor returns going forward. We anticipate investor cash on cash returns in excess of 7% year one with subsequent increases as we benefit from fixed debt service payments for the term of the investment.